We are a major manufacturer, exporter and supplier of a wide array of impeccable quality Boiler Chemicals. These chemicals are used for treatment of water and removal of impurities. 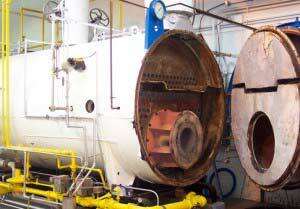 Besides, Boiler Chemicals offered by us is widely demanded by the clients. Also, these chemicals are priced affordably. An intermediate for textile lubricants, softening agents, adjuvants, whitening agents, sizing emulsifiers, rubber vulcanization accelerators, antioxidants, surface-active agents, plasticizers, viscosity improvers, insecticides, fumigants, herbicides, dyes, catalysts, bactericides, analgesics, anesthetics, and other physiologically active agents. As a vinyl monomer, used in efficient inhibitor agent of conjugate olefins. In liquid or gas phase, if end gather seed is existed,it can be used as inhibitors of end gather. It's a excellent end agent in process of Emulsion-polymerized styrene butadiene rubber. It's a antioxidants of the unsaturated oil and resin. In the environmental protection, it’s good photochemical smoke inhibitors. It's used as corrosion inhibitors in the equipment of the boiler feed water and steam heat exchange. It's used as antioxidant in photography screens potions. Pay attention to level, it must be the photography level,and appearance is colorless liquid. Industrial level can not be used here. Cyclohexylamine is colorless to pale yellow clear liquid, no visible impurities. It has strange odor. It is a strong organic caustic liquid, It can form azeotrpe with water at 96.40°C, miscible with a lot of organic solvents. Cyclohexylamine is the raw material for producing desulfurization agent, boiler corrosion inhibitors,boiler water treatment, vulcanization accelerator, emulsifier, antistatic agent, latex coagulant, oil product additives, corrosion resistance agents, fungicides, pesticides and so on.